(Nanowerk News) New materials are crucial to building a clean energy economy—for everything from batteries to photovoltaics to lighter weight vehicles—but today the development cycle is too slow: around18 years from conception to commercialization. To speed up this process, a team of researchers from the U.S. Department of Energy's Lawrence Berkeley National Laboratory (Berkeley Lab) and the Massachusetts Institute of Technology (MIT) teamed up to develop a new tool, called the Materials Project, which launches this month. "Our vision is for this tool to become a dynamic 'Google' of material properties, which continually grows and changes as more users come on board to analyze the results, verify against experiments and increase their knowledge," says Kristin Persson, a Berkeley Lab chemist and one of the founding scientists behind the Materials Project. "So many scientists can benefit from this type of screening. Considering the demand for innovative clean energy technology we needed most of these materials yesterday." 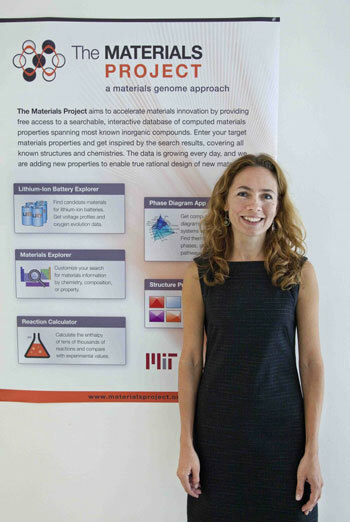 The Materials Project employs an approach to materials science inspired by genomics. But rather than sequencing genomes, researchers are using supercomputers to characterize the properties of inorganic compounds, such as their stability, voltage, capacity, and oxidation state. The results are then organized into a database with a user-friendly, web interface that gives all researchers free and easy access and searching. "First-principles calculations have reached the point of accuracy where many materials properties, relevant for photovoltaics, batteries and thermoelectrics, can be reliably predicted," says Gerbrand Ceder, an MIT professor of materials science and engineering and founder of the Materials Project. A better battery—one that is cheaper and has more power and energy while being safe—could finally make possible the dream of an electric vehicle reaching performance and cost parity with a gasoline-powered car. But beyond batteries, novel materials could transform a host of other industries, from food packaging to buildings. For example, the Materials Project is working with with several entities interested in making stronger, corrosion-resistant lightweight aluminum alloys, which could make possible lighter vehicles and airplanes. "Materials innovation today is largely done by intuition, which is based on the experience of single investigators," says Persson, who works in Berkeley Lab's Environmental Energy Technologies Division. "The lack of comprehensive knowledge of materials, organized for easy analysis and rational design, is one of the foremost reasons for the long process time in materials discovery." President Obama has recognized the importance of advanced materials with his announcement in June of the Materials Genome Initiative "to double the speed with which we discover, develop, and manufacture new materials." Many of the concepts of that initiative were inspired by the Materials Project, Persson said. With the help of supercomputers at the Department of Energy's National Energy Research Scientific Computing Center (NERSC), the Berkeley Lab Lawrencium cluster and systems at the University of Kentucky, the Materials Project database currently contains the structural and energetic properties of more than 15,000 inorganic compounds, and up to hundreds more are added every day. Researchers are continuously adding new properties to enable true rational design of new materials for a wide variety of applications. To build the Materials Project web tool, the team approached computer systems engineers at NERSC who have extensive experience building web-based interfaces and technologies – called science gateways – that make it easier for scientists to access computational resources and share data with the rest of their community. "The Materials Project represents the next generation of the original Materials Genome Project, developed by Ceder's team at MIT," says Shreyas Cholia, a NERSC computer engineer who helped develop the Materials Project tool. "The core science team worked with developers from NERSC and Berkeley Lab's Computational Research Division to expand this tool into a more permanent, flexible and scalable data service built on top of rich modern web interfaces and state-of-the-art NoSQL database technology." The Materials Project, which will be hosted on NERSC's science gateway infrastructure, was developed with support from the Department of Energy and a Laboratory Directed Research and Development grant from Berkeley Lab. In addition to Persson and Cholia, other Berkeley Lab contributors to this project include Michael Kocher, Daniel Gunter, Annette Greiner, David Skinner and David Bailey. MIT collaborators include Gerbrand Ceder, Shyue-Ping Ong, Anubhav Jain, Geoffroy Hautier and Evgueni Chtykov.